Missed the kickstarter? Pre-orders for the book will open soon! Join the mailing list now! 359 backers pledged $13,048 to help bring this project to life. Jupiter is a collection of 100 illustrations with 100 corresponding micro fiction stories. Each story is a self contained adventure that takes place on Jupiter, billions of years ago when it was close enough to the sun to sustain life. This project started as a challenge from a friend to do daily drawings in an extra small Moleskine daily planner, and after the first few days of doodling I began to create short one sentence stories for each of these illustrations. Sometimes the story would come first, and that would fuel what I would draw, other times an image would pop into my mind and I would write the story afterwards. At a certain point I began to imagine that all of these stories were taking place in a specific place, but at different points in time. Eventually I developed the idea that it would take place on Jupiter, billions of years before Earth had begun its journey into life. Originally I had planned on making a simple "print on demand" version of the book, but as the months passed by my friends and colleagues continued to badger me about taking the project a step further. After much debate I came to the conclusion that the design of this book would not look right as a simple paperback. I imagined Jupiter resting on someone's table, or nestled between other books on a shelf and the idea of it being a cloth hard cover just felt so right. I want the outside of the book to reflect the elegance of the inside. So here is a peek at the final product. If you can't tell its a photoshopped rendering of the book, so the real product will vary slightly. The book will measure 4" x 6" and it will be roughly 220 pages long. All the images will be grayscale. There will be 100 stories partnered up with 100 illustrations, they will be separated into 7 different themes. 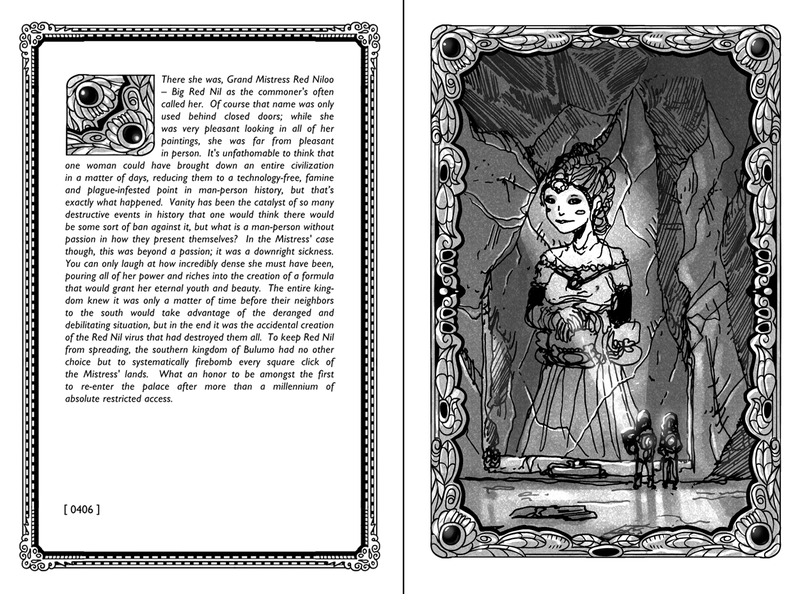 The numbers on the bottom left corner of each story are the dates on which I drew the original illustration in 2013. Below you'll find examples of the pages. Each theme has its own border, reflecting the age and overall feeling of the story being told. CLICK FOR A BIGGER VERSION! If for whatever reason you'd like to make some sort of special combo reward (ie- combine offers, order extra copies) please feel free to contact me, I'll try to accommodate requests! If you want to combine offers with a limited quantity reward, please be sure to pledge on that offer first so you don't lose out! Guys n gals, this book is 99% complete. The only thing left to do would be the 7 custom made drawings and stories for the lucky Kickstarter pledgers who claim them. With your help I feel this will be one of those unique little books that your friends are constantly picking up from your bookshelf and refusing to return until they've read through its entirety. Thank you all for your support, it means the world to me! 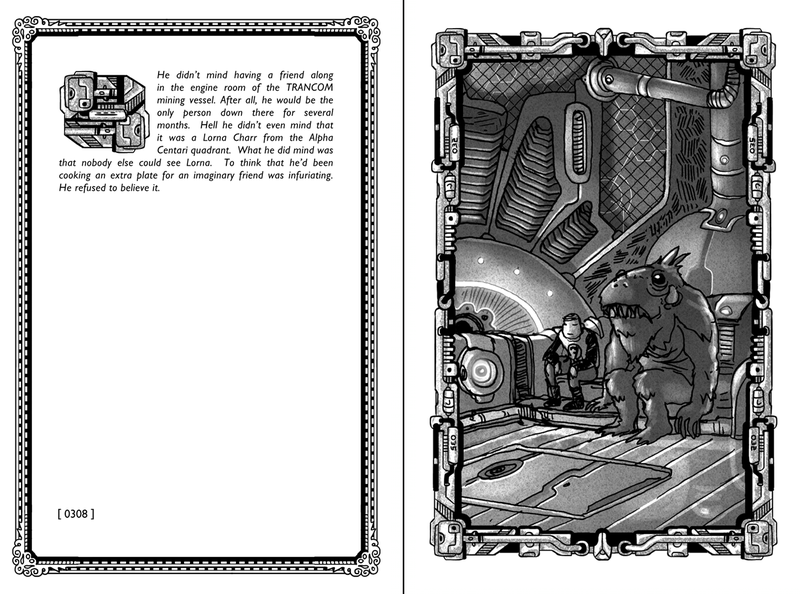 DIGITAL LOVE: A pdf copy of JUPITER. MICRO TOME LITE: physical hardcover copy of JUPITER. shipping included. THREE POSTCARDS WITH MY FAVORITE STORIES AND ART FROM THE BOOK! MICRO TOME SCRIBE: physical hardcover copy of JUPITER, signed with a detailed, lightly colored drawing inside. 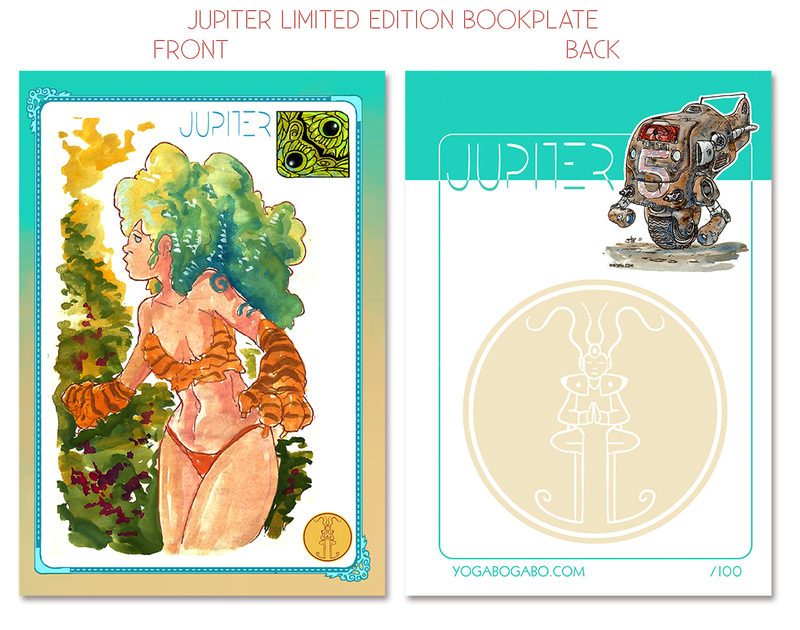 MICRO TOME LTD PLATE: physical hardcover copy of JUPITER, signed with a detailed, lightly colored drawing inside. 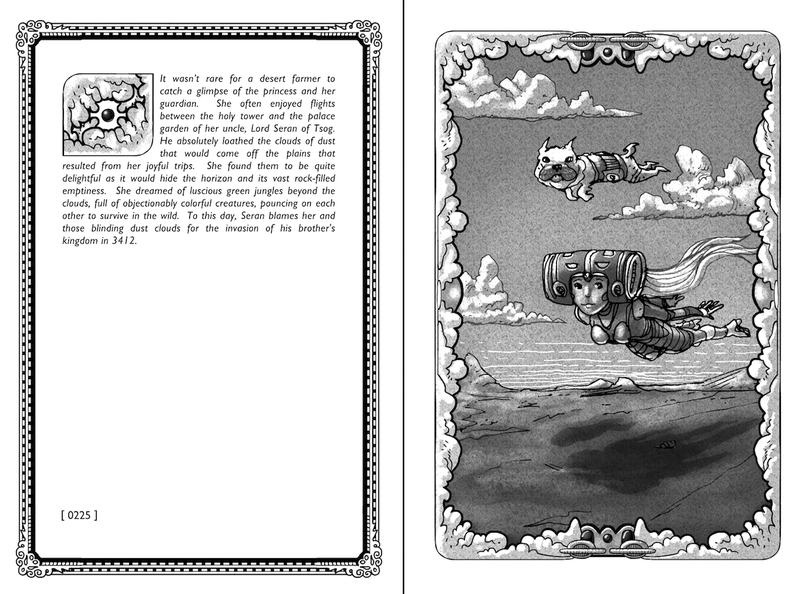 PLUS a limited edition bookplate, only 100 made! 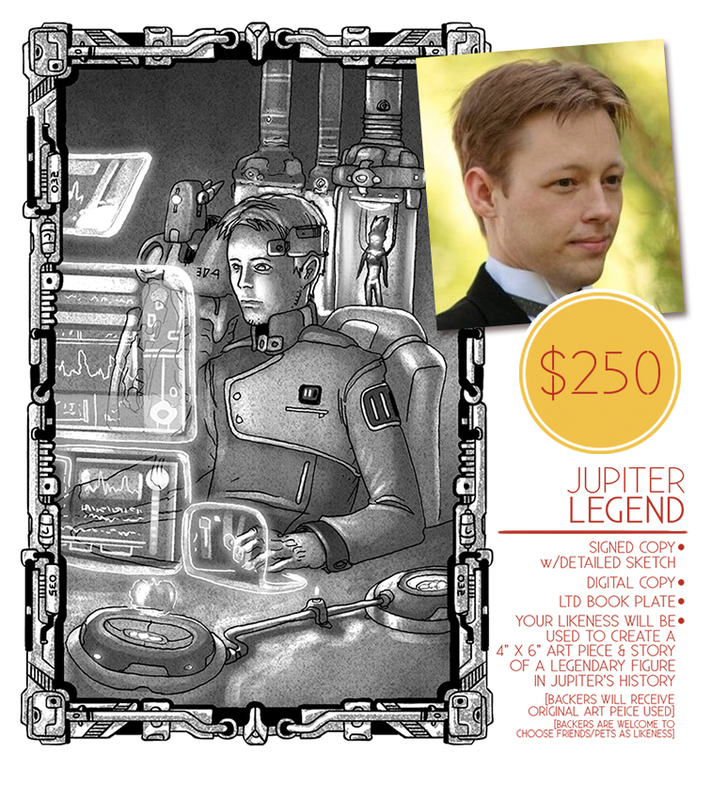 JUPITER LORD: Backers will receive an 11x17 inked piece of art, landscape or portrait. Limited to 1 character and partial background. JUPITER LADY: Backers will receive an 11x17 inked piece of art, landscape or portrait. Limited to 1 character and partial background. JUPITER LEGEND: Your likeness (or whoever you choose, animals included) will be used to represent one of the 7 great visionaries/tyrants/leaders of this mystical planet! Backers will receive the original art created. More detailed info on Kickstarter description! JUPITER DIETY: ONLY 3 SPOTS FOR THIS. I will produce a 7x16.5 widescreen format watercolor illustration. Example is shown on the left!